The number of times you've been caught out and about without a bar of gold is set to be a distant memory—at least for Florida and Las Vegas residents, who'll see hundreds of these ATMs installed next year. The Emirates Palace Hotel in Abu Dhabi was the first place to install cash machines that hand out 10-gram bars of 24-carat gold bars in exchange for money, but in true American fashion similar machines will be situated on each side of the coast from next year. 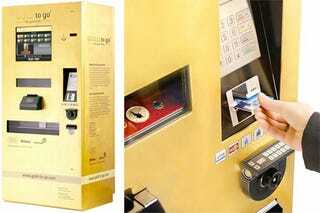 A "couple of hundred" of the German machines, catchily branded "Gold to Go," will join the 35 machines that have since been installed across the Middle East, Italy, Spain and Germany this year.